Michigan State athletic director Mark Hollis was wrong for tweeting advice to Michigan point guard Trey Burke about whether he should stay in school or declare for the NBA Draft. 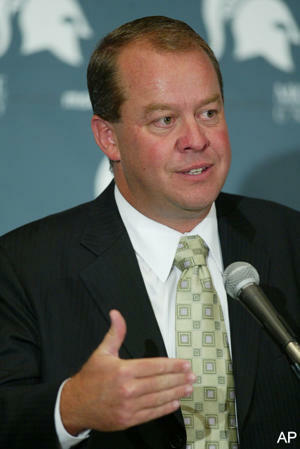 Michigan athletic director David Brandon was correct to call Hollis out quickly about the tweet, doing so respectfully. Hollis' tweet to Burke points out the paranoia the so-called Spartan nation has about Michigan basketball. It's amazing, since the end of the season, in the collective mind of the Spartans, how Burke went from an overrated college player to a viable NBA prospect as a 5-11 point guard after just one year of college basketball. Here's the obvious: Hollis should be worried about his own athletic program. His tweet suggests obsession with Burke's status. Here's a suggestion to Spartans everywhere. It comes from a line in an old song by the Kinks: "Paranoia will destroy you." And another, and this one comes from MSU football coach Mark Dantonio after Mike Hart's "Little Brother" comments when Michigan beat his first team in a close game: "Pride comes before the fall." When the Spartan faithful started getting a little of full of themselves, what happened? Louisville 57, Michigan State 44. I don't ever remember MSU's athletic program in this good of a position. Why not enjoy the ride rather than acting in manner you have openly despised down through the years? The Red Wings have had a weird season, but as it winds down, there is no denying the trend. They have been a bad road team this season. Bottom line. In that sense, their 4-2 loss to Columbus Wednesday shouldn't have been that surprising. Was it any different than getting blown out at the New York Islanders earlier this season? Or at Montreal when the Canadiens had been playing dreadful hockey? No. Just more of the same. Good news: The Red Wings have lost just five home games all season. Bad news: The Red Wings have posted just their second losing road record in two decades. And it isn't just a bit below .500. They are five games below .500. The Red Wings have lost seven straight road games, and haven't beaten a winning team on the road since Vancouver on Feb. 2. And the Blue Jackets are awful and were playing with an emergency goalie Wednesday. Yeah. Allen York stymied the Red Wings. Without question, considering what is at stake - home ice advantage in the opening round of the playoffs against Nashville - the Red Wings definitely hit a low point Wednesday. 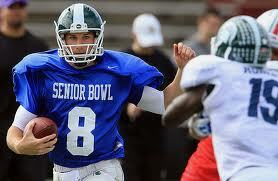 As the NFL Draft approaches, look for the stock of Michigan State quarterback Kirk Cousins to rise, not fall. Why? To some degree because of the success of a similar-style QB, Andy Dalton of the Cincinnati Bengals, last season. The NFL is the ultimate copycat league, and the same concerns about Dalton before last year's NFL Draft are being raised about Cousins. While Dalton was praised as a "winner" and the consummate "game manager," the issue of his overall athleticism was brought up. He wasn't Jake Locker. Conversely, Cousins isn't Robert Griffin III. 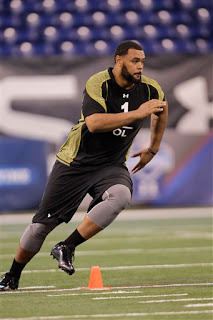 But he has plenty of arm strength and distinguished himself at the Senior Bowl. It's not like Cousins is a complete and total statue. His pocket presence is OK. And undoubtedly, Cousins presents tremendous leadership potential because of his unquestioned work ethic and strength of character. Dalton wasn't over-matched by the NFL. As the 35th overall pick in the draft, Dalton had one of the best seasons ever by a rookie QB, throwing for more than 3,000 yards, 20 TDs and 13 interceptions. Look for Cousins to be drafted late in the second or third round, too. And when he is drafted, listen to gurus. The first name they will mention: Andy Dalton. Standard baseball procedure is meaningful player evaluations aren't done in spring training. It's also to leave the door open for change early in the season. Those are the two reasons the right decision by the Tigers would be to keep Brandon Inge on their roster for opening day, even though he has clearly been outplayed this spring by Danny Worth, who has more overall value as a backup infielder because he is probably their best shortstop defensively - in addition to being a solid third baseman and a very good second baseman. Inge hitting .171 in spring training doesn't mean as much as hitting .324 as a club is clinching a division title in September, or posting a .929 OPS in extensive postseason play. Inge did turn it around after biting the bullet and going to Toledo late last season. Worth is having a good spring with a .296 batting average and a .931 OPS. At 26, he is primed for his shot as a backup infielder, which will be his role if he is able to perform well enough to remain in the major leagues. He is a very good fielder. He is, at best, an OK hitter. He hit .256 at Toledo last year with a .759 OPS, which was a good season by his previous standards. Inge is the better option at third base over Worth. It's another factor with Miguel Cabrera's situation there becoming even more precarious because of injury. Inge's contract is another factor. The Tigers should find out for sure he is the Inge from the first half of the last season, not the late season and postseason version, before unloading $5.5 million. There can also be a danger, though, in keeping a player for those reasons. We saw it during the Alan Trammell regime when Dmitri Young led a mutiny in the clubhouse because Bobby Higginson made the team over Marcus Thames. But Inge isn't the polarizing figure in the clubhouse Higginson had become, nor has Worth established his credentials to to the degree Thames did. And Jim Leyland has a much stronger grip on his clubhouse than Trammell did at the time. What the Tigers can't do, is if Inge does not perform up to major league standards, is let it go on for months like last season, especially if Worth is performing well at Toledo. I don't believe they will this time. - Like Michigan State, Louisville isn't intimidated by the big stage. The Cardinals are also very good defensively. These are two heavyweight programs from heavyweight conferences. This about tough basketball, not pretty basketball. - Rare bad decision by Draymond Green. He took that shot too early before the end of the half. A costly six-point swing. - Off missed shots, the Spartans have to push the basketball down the floor quickly. Louisville's halfcourt defense is surprisingly effective. - The best part about MSU tonight so is their interior defense. It's been very good. State's inside game is their edge. They have to be smarter about not getting offensive fouls. Sports Illustrated made an intriguing forecast for the coming season. The magazine has the Tigers winning 93 games and topping the American League Central, but losing in an American League Division Series to the Yankees. Last year, that would have been a good year for the Tigers, who had never won the AL Central before, and hadn't reached the playoffs since 2006. But after a 95-win season, ousting the Yankees in the playoffs for the second time in six years and pushing the Rangers in the American League Championship Series - and then signing Prince Fielder to a $214 million contract - it's World Series or bust for the Tigers. It's an unfair expectation. The playoffs are fickle. The Tigers, for example, were only a big hit or two away by the Yankees of getting knocked out of the ALDS. They could have easily won the ALCS. The Cardinals won the World Series last season. They didn't get into the playoffs until the last day of the season. In the new playoff format, they would have had to win a one-game playoff just to remain in. Also, Prince Fielder is a better hitter than Victor Martinez, but VMart just fit what the Tigers do perfectly, while it remains to be seen how that works with Fielder, especially with Miguel Cabrera moved to third base. 93 wins and a division title is a good season. But with rank comes responsibility. Will be a fun summer seeing if the Tigers can earn their stripes. Signing Peyton Manning was a wise move by the Denver Broncos. They have a strong defense, a solid offensive line and a good running game. Manning should thrive - if he is healthy. He could very well take the Broncos to the Super Bowl. But given the seriousness of his neck injury, that remains "iffy." 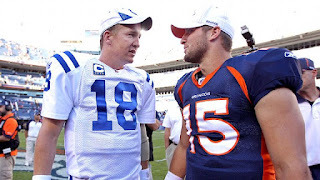 If he is a reasonable facsimile of what he has been with the Colts for many years, Manning will thrive. But if he can't be, Tim Tebow is not a bad insurance policy. He is also not costly. He is making less than $2 million this year, and has three years remaining on a reasonable rookie contract. He was a first-round draft pick, who won a playoff game as a starter last season. Where he is going to go as a starter? And please, it can't be Jacksonville, unless the ownership and management of that franchise has totally lost their collective minds. Tebow does not have close to the upside Blaine Gabbert does. But there is potential there with Tebow, despite the rough edges. Given more time to develop, especially under Manning, Tebow could eventually become a better QB than if he were playing regularly this season. The only way the Broncos should justify trading Tebow is for a first-round pick. And I don't see that happening. Forget the quarterback controversy. There is none if Manning is healthy. I hear people constantly and legitimately lament about the prices for live sporting events in the Detroit area. Guess it is the cost of being a major league city. You pay big league prices. There some options, though. OHL hockey with the Whalers out in Plymouth. Another is mid-major college basketball. Detroit and Oakland basketball. Tonight, with the Pistons and the Red Wings off and no NCAA tournament games, Oakland plays Rice in the College.Insider.com Tournament. Oakland has won a couple games in the tournament already, but this might be the Golden Grizzlies last home game in the event. 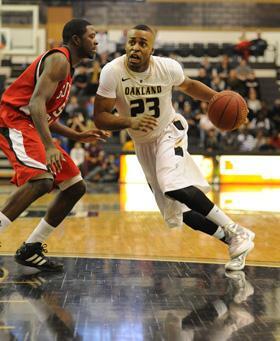 Reggie Hamilton, Oakland's point guard, led the nation in scoring this season. He could be playing his final home game. The tickets are reasonably priced. Just $7. Less than the cost of a movie. Also, Rice is coached by Ben Braun, who took Eastern Michigan to the Sweet 16 one year, and who also had a long stint at Cal. I honestly don't have any idea how well Miguel Cabrera at third base is going to work out for the Tigers in the long run. It's impossible to gauge in spring training. The fields are hard and sun baked. The regulars often don't play. 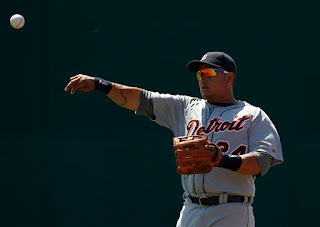 Cabrera has has weight issues. Will he be able to keep the weight off once the season starts and it becomes "baseball nights" (late nighst, long trips, a scattered schedule when it is more difficult to maintain eating and workout habits). I do know this, his risk for injury is no greater at third than it would be at first base. That doesn't change just because he took a bad-hop grounder off his face in an exhibition game. If anything, a first baseman is more prone to injury than a third baseman because of potential collisions or being spiked. St. Louis has been successful in slowing down the tempo and making this an ugly game. It's why it is reasonably close. Conversely, the Spartans have done a good job of being patient. In fact, the Spartans have been better than St. Louis in that regard. Overall, a good first half by MSU. It could have been a lot worse. 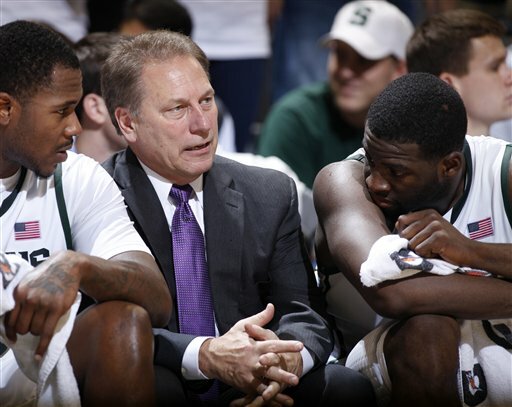 - The Spartans must take better care of the ball. State has had too many turnovers. Nine? Come on? - The only way St. Louis will ultimately keep this game close is by hitting 3-point shots. Otherwise, Michigan State will pull away in the second half. Shot selection by St. Louis so far has been questionable. Michigan State deserves a lot of the credit for that defensively. 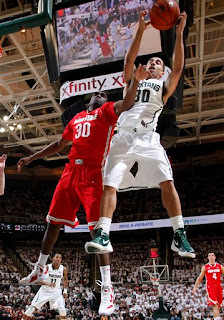 The Spartans are very difficult to shoot against, and are playing typically strong defense. - If the Spartans manage to get a bigger lead, it will be extremely difficult for the St. Louis to rally. The Billikens are like a football team without an effective passer. It will make the first five minutes of the second half exceptionally important. State is capable of adjusting at halftime and making an early run. - Run at the end of the half was desperately needed by Michigan. Game was getting away from the Wolverines. Tim Hardaway Jr. keeping the Wolverines in the game. Need better balance scoring. - Two reasons Ohio jumped ahead in this game: Unforced turnovers by Michigan and the Wolverines defense is not good. Ohio is getting too many good looks at the basket. There is a reason Ohio's shooting is hot. - Trey Burke has to impose his will on this game. He didn't in the first half. If he is the best player on the floor, and one of the best in the country, this is the time to prove it. - The crowd is overwhelmingly for Ohio. Not a surprise. Everybody is waiting for an upset. If Michigan doesn't play much better in the second half, this could be it. - D.J Cooper has been everything Burke is supposed to be. - Michigan has to get some offensive rebounds. It's not a strength, but against Ohio there are no excuses. Contract negotiations are always a little prolonged, aren't they? Ideally, Calvin Johnson would have signed a long-term deal with the Lions before free agency started. Maybe they would have had a shot at Cortland Finnegan before he left the board, or re-signing Eric Wright, now that their salary cap is lower for the coming season. But this free agency signing season does prove how valuable and difficult it is to obtain and retain cornerbacks. Finnegan is a good player. It's difficult to tell at this point what portion of his contract is guaranteed money (it's not all $50 million). But he is undersized and just solid at this stage. He had three interceptions the last two years, just one last year - and made few other plays. Wright did well for the Lions until he became banged up physically, but to his credit, he played through his injury issues. But he reportedly got more than $15 million for the next two seasons guaranteed. His ability and that kind of money don't match. It's why the Lions must address cornerback in the draft. Sometimes it's not the best value when it comes to player by player comparison in each round, but it is always when it comes to position. A corner has to get a higher grade. And the Lions would be wise to also cover themselves in the back seven at safety. They need better range deep, which would help take pressure off their corners. By the way, this free agency season points out the most important free agency signing by the Lions last year - retaining Chris Houston. Backup quarterback Shaun Hill reportedly is visiting St. Louis. Either Hill or Drew Stanton has to go. The Lions can't afford two backup QBs at their cost. Stanton recently visited the New York Jets. - I like Michigan State coach Tom Izzo's emotion normally, but it made so sense to draw a technical foul there. Costly in terms of points. Real costly in regard to a momentum shift. - Brandon Wood is this year's version of a player who is stepping forward in the postseason for MSU. He seems to get better with each game. His role picking up scoring slack from losing Brandon Dawson can't be overstated. - Performances like this one are telling about Jared Sullinger. He should have dominated the conference this season. He didn't. Makes you wonder how good he will be in the NBA. - Ohio State's Aaron Craft is one of the best defensive point guards I've seen in the Big Ten. Wasn't a mistake how he held down Michigan's Trey Burke. Having another good game today. - This is a terrific game. Two very good teams going at it. Second half will be even better. If Michigan State wins today, I'll concede the point the Spartans have the best college basketball program in the state. Then again, that was my point - do it on the floor. Michigan had pulled even. And that could change back if MSU is knocked out before Michigan in the NCAA tournament. I expect MSU to advance further than Michigan. If MSU loses today, the Spartans will merely have been knocked out by the same team as UM in the Big Ten Tournament a game later. That makes it huge for the in-state rivalry. - Michigan fans are rooting for Ohio State more than MSU today. Those who say they aren't are not telling the truth. - This is obviously a pick 'em game, but if State wins it, they have earned a No.1 in the NCAA tournament. The Spartans are just a stronger team than Missouri. Kansas getting knocked out in the Big 12 Tournament should count for something, and it isn't a No. 1 seed. Florida State winning the ACC Tournament should help MSU's cause. Ohio State hasn't done that much non-conference on the road or at neutral sites. Even if they win today, Buckeyes should be a two-seed. - State has to take the ball inside and drive. Try to create fouls. OSU will be in trouble if it has to reply on its bench at all. If Michigan State beats Michigan in the Big Ten Tournament. Or wins the Big Ten Tournament. If Michigan State goes considerably deeper in the NCAA tournament than Michigan. OK, then the Spartans can maintain their claim as the preeminent college basketball program in this state. And I'll be the first to give MSU that credit. And I said as much in my recent entry in this blog. But to look at the vividly defined evidence that strongly suggests the Wolverines have pulled even with the Spartans on the basketball floor and refute it, is ridiculous. - Split head to head. - Michigan had a couple bad losses in the Big Ten. So did MSU. Remember Illinois and Northwestern? Michigan won road games in both those gyms. MSU lost there. - I didn't mean to slight MSU's incoming recruiting class. I wasn't writing "War and Peace." Just an entry in my blog. MSU's class is excellent. But a strong case can be made Michigan's is equal. Let's put it this way, Tom Izzo would somehow find room for a scholarship for Mitch McGary, don't you think? - Worse of all, is this pathetic whining by MSU fans when they are presented with the truth. It's like Michigan fans claiming the Spartans haven't pulled past the Wolverines on the football field based on the past. They can't stand this behavior by Michigan fans, yet they are acting the exact same way, if not worse. I said or written it a hundred times the last couple days. If the Spartans are really all they claim to be in basketball, they must prove it on the floor. Honestly, they didn't the last two games of the regular season. They blew it, and all the cache that would have come with a victory in one of those two games and an outright Big Ten title. They have a shot a redemption this week in the conference tournament, especially if they meet either OSU or Michigan. And the NCAA tournament is even more important in that regard. Until then, Spartans should quit thumping their chest about their three-way tie for the Big Ten regular season title and claiming entitlement based on 2010 and back. Michigan can make the exact same claim about the conference title this season, and has played as well or better than MSU for nearly two seasons. It's up to State these next few weeks to prove that's an aberration, not a trend. Michigan State fans don't like this notion, but I believe it to be true. Not based on 2008 or 2009. Or 2000. But in the world as it exists in 2012. The one we live in now. Michigan's basketball program has caught Michigan State's. Why? The proof? They had the same record this season in the Big Ten, sharing the conference title. They split their two meetings. The Spartans schedule was tougher than Michigan's overall, but not to the degree MSU's faithful is saying. State had nice wins over Gonzaga and Florida State. But didn't anybody notice Gonzaga lost to St. Mary's in the West Coast Conference title game Monday? Michigan did beat UCLA, Iowa State and Memphis in non-conference play. Not bad. Like MSU, the Wolverines did split with Ohio State. I don't see how Michigan State should extra credit for losing to North Carolina and Duke. Oh, Michigan lost to Duke, too. And then there is next season. 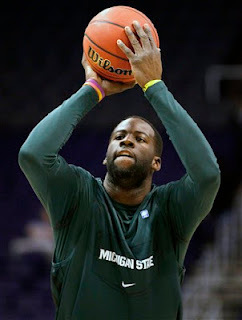 State will be formidable, but won't have Draymond Green. Michigan figures to be better than State if Trey Burke, Tim Hardaway Jr. and Jordan Morgan return (there is no indication they won't), and with the addition of a much needed big man in five-star recruit Mitch McGary. Will this perception change? It could. It depends on the next few weeks. Who does better in the Big Ten Tournament? If they play again, who wins on a neutral court? If State makes another run to the Final Four and Michigan is knocked out much earlier, then OK, MSU will have proven a point. Yet, they have to prove it. The Spartans didn't during the regular season. Rather, it was more like Michigan stated its case. - It could be next to meaningless if the Spartans beat Michigan and/or Ohio State in the Big Ten Tournament and then go on a long run in the NCAA Tournament. Ultimately, and I don't necessarily like this aspect, but the latter is all that matters in college basketball. The difference is this year the Spartans can't just float through the Big Ten tournament as if it doesn't matter. It does this year. Their seeding for the Big Dance could drop to the point it could hinder them if they perform typically in the conference tournament. - Michigan is MSU's equal at this point. It's not like MSU has a slew of impressive non-conference victories under its belt. Head-to-head, the two teams split. They also split against Ohio State. If the NCAA tournament opened tommorrow, the Spartans have not earned a better seed than either Michigan or Ohio State. - This is where the character test of MSU's program comes in. Sunday's loss was profoundly disappointing, but telling of why the Spartans were having success before this recent slide. They aren't so gifted they can overwhelm teams. They have to be a little tougher, in the Izzo mode. They must return to that for the postseason tournaments, or they will falter. Bottom line. Three different teams - Buffalo, Washington, New Orleans. 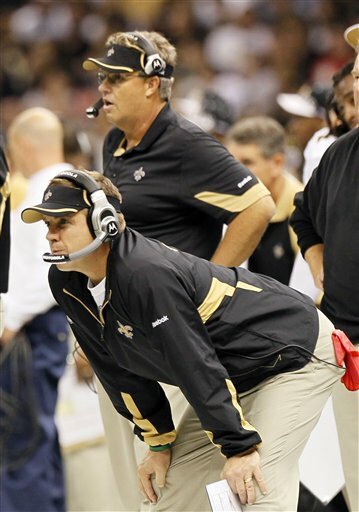 And the same story is emerging each time about Gregg Williams. That he did have a bounty system in place to pay his unit for injurying opposing players. If true, it's deplorable, and Williams, currently the defensive coordinator for the St. Louis Rams, needs to be severely punished. Football is a rugged and violent game. Injuries are going happen in the course of the game. But to encourage them is no different than doing so in any place of business. It's like handing out a bonus to a sales person for physically hurting a top sales person of a competitor. I don't care if it was part of the fine system the team had in place for being late for meetings - or whatever. This is the type of issue consideration should be given to banning the coach from the NFL, and needs to weeded out from the league, if it is more common place than isolated. If true, Williams should be suspended for, a minimum, of a year. The one concept I don't know if it would work is the part about an MLS soccer team in this area. Look, I bash soccer a lot, but much of it is done tongue-in-cheek because the people who are really into it tend to exaggerate its scope compared other sports in this country, and particularly in Southeastern Michigan. It is not going to take over for baseball in this nation, or hockey in this area. It's huge world wide, but a relatively small niche sport here. It's like once a year there is a some soccer moment that happens that is allegedly going to set it off in this nation. It never really does. The game does have appeal, but it's limited and it's not the MLS. It's more the international game. The World Cup. The European Championship. The elite leagues in Europe. The MLS is a dud in comparison. I did go to the AC Milan game at Silverdome in 2010. It was an excellent game. I enjoyed it. It was surreal at the Silverdome - like being dropped back into the early 1990s or something. The facility is badly outdated. They also didn't do a good job that night getting people into the stadium because the lines for security were incredibly slow.